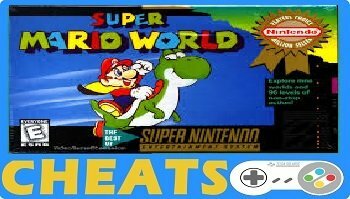 Do you need cheats + codes for Super Mario World on the Super Nintendo? Your in luck as this page contains all the cheats and codes you will need. On the main menu when you have to select a file to save your progress on simply press select and this will enable Easy Mode. The only thing that changes in the game is there are less enemy’s. When you start the game go to the level on the right named “Yoshi’s Island 2” and beat the level. Now go back in to the level and pickup the red shell at the beginning of the level and jump on to the first ledge you see. When the first red turtle comes in to view let go of the red shell and keep running to the right. The shell will now kill all the turtles and give you a 1 up 🙂 Now press start then select to exit the level, Now go back in to the level again and repeat the process as many times as you wish. When you have died press start before mario falls off the screen. Now press select and this will exit you from the level. This cheat can only be used if you have completed the level already. In the top secret area level is an extra live as well as two flowers and two feathers. You can re-enter the level as many times as you wish. To get to the top secret area enter the Donut Ghost House level with a feather, then run right for three seconds then stop and run left and fly up to the top of the level. You will be able to land on the platform, now run right drop down and enter the door. Now when you exit the level it will take you to the top secret area. To do this all you need to do is stand in the same place and jump every 2 seconds. You will then always hit the same item which will give you more lives. You need a yoshi for this one. Once you have jumped on a P switch turn around and get yoshi to eat it. Yoshi will eat it then spit it out. Just before you jump in to the goal line at the end of the level make sure you are holding an item as this item will turn in to a 1up mushroom and give you an extra life. Don’t want to play a level? Simple enter a level with a cape then run (holding the B button) for a sufficient distance (about the length of the screen) and then jump into the air. Mario will climb for a short duration, but in order to continue flying, you must hold the B button and rock Mario back and forth using the right and left buttons on the D-Pad. For higher jumps run then hold down B + Y. If you have Yoshi you can also jump while on yoshi then spin jump off Yoshi to get a bit more height. If you have Yoshi make sure you eat all the green apples on the trees as these will give you additional time to complete the level. When the timer is about to reach zero pickup a powerup (Mushroom, Cape Feather, Fire Flower) at the same time the timer hits zero, you will hear the sound as if mario has died but you will be able to continue on the level without dying. If mario runs in to a mushroom he will power up in to a large mario and can now take two hits. If you now get on a yoshi you can now take three hits. It is also possible to jump back on to Yoshi after he has been hit. secret ghost house to unlock the first star road warp. Beat the first 4 levels of star road alternate goals. When you get to the fitfh level you can take the warp to valley of bowser next to bowsers castle. Just beat it and your done quick! Replay Beaten Castles : Once you have beaten a castle level the castle will collapse and you will not be able to re-enter the castle, until now 🙂 To re-enter the castle simply press and hold L+R while on the castle map node to re-enter it. 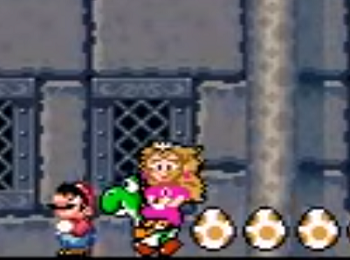 Weird Mario Dance Ending : When you have defeated Bowser, quickly enter Hold L+R+X+Y+Up while the princess is being freed. Hold the buttons until the credits show up. Mario will then do a strange dancein the credits. Original Mario Music : In the “Special Zone”, wait about 5 minutes and listen to the music. It should start playing variations of the original Mario Bros. song! Life Switch In 2 Player Mode : When at the map in two player mode, press L or R to exchange the number of lives with the other player. The other player will die. You can also bring back a player with no remaining lives this way. Secret Level Exit Indicator : Some levels have 2 or 3 exits. If a level has more than 1 exit the level will contain a red dot on the map as shown in the picture to the right hand side. Star Road Music Change : When you are on the star road don’t press any keys on your controller for 5-10 minutes. The music will then change. 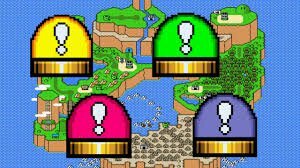 Special Mario Song : Make it to the star worlds and then to the Special Levels. Don’t press any buttons for 5-10 minutes. A Caribbean version of the classic Mario theme will play with steal drums. Climb and Carry An Item : Stand next to a vine with an item. 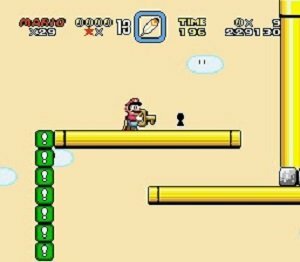 Hold Up and release Y to throw the object into the air, and quickly climb the vine while holding Y. Mario will automatically catch the item as it falls, and may continue to climb the vine. Mark Game as 100% Completed : There are 96 levels in super mario world (Including secret exits) Once you have completed all levels save the game then reset the game and go to the game load screen, You will then see a number 96 with a star by it, next to the file you completed the game with. There are a few things you can unlock in this game, They are listed below. Red World Map : Complete The secret world then Enter the second Star road that Appears after you Complete Funky. The world Map will Have A different Colour Pallet (Shown to the right) and some enemies will look different. There are two different areas / zones you can unlock, they are called Star zone and special zone. Unlock Star Zone : To enter Star Zone, Clear Donut Plains 1 using the keyhole. Then, clear Donut Secret using the keyhole. Finally, beat the Donut Secret Ghost House in the secret exit. The normal exit takes you to the pipe. The secret exit (You have to find the secret door, and kill the Big Boo boss) will take you to Star Road. Unlock Special Zone : To unlock Special Zone Complete all five stages in star zone by finding the keys and putting them in the keyholes and crossing the end stage goal. 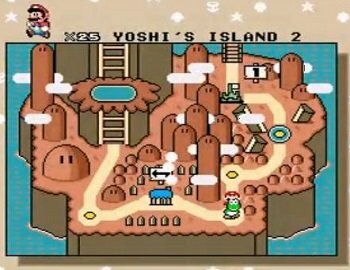 There are four special switch palaces in super mario world. When you play levels you will see some blocks with one of four coloured dotted lines around them. At first you will be able to jump through the blocks but after you have found the switch palace for that block the block will become solid so you can jump on the block and some blocks have items in them. Sometimes these blocks can be used to access secret areas in the game. To find these switch palaces follow the instructions below. Yellow Switch Palace : The yellow switch is located in the first world section. 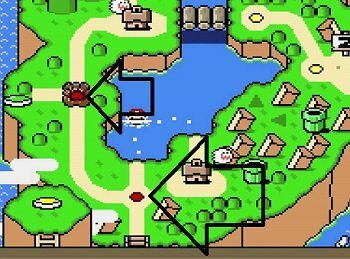 Keep going left (from the beginning of the game) on the world map until you reach the Yellow Switch Palace, already shown on the map. Blue Switch Palace : Go to Forest of Illusion 2. Continue through the level until you reach the end direct path to the level goal. Instead of going all the way right, go left. You will see what seems like a dead end, but continue going and you shall eventually reach a key and keyhole. You will know you’re on the right direction if you go past a “!” box with a mushroom inside it. This will then open up the Blue Switch Palace on the world map. Red Switch Palace : Go to Vanilla Dome 2. Half way through the level you will see an empty opening above you except for one yellow box in the corner of the wall on the left side. Jump on this box and jump again onto the left side. Continue going until you reach a “P” switch. Take the “P” switch and go left until you reach a dead end of boxes blocking your way. Use the “P” switch and jump the gap the boxes leave until the next gap. Go down this gap to find the key and keyhole. Green Switch Palace : Go to Donut Plains 2. Once again half way through the level you shall get to an area of massive sand blocks moving up and down with many pipes coming from the roof of the cave. There will be a small group of 3 pipes bunched together near the end of the moving sand blocks. Take the green pipe. Defeat the football player enemy to find four boxes in the air like stairs. If you have a cape, hit the fourth/highest box to reveal a vine or if you have no cape. Climg the boxes to hit the fourth/highest box. Climb the vine and you will find the key and keyhole.